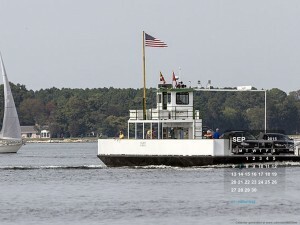 Oxford-Bellevue Ferry | Oxford Maryland Vacations! Take a Ride on the Oxford Bellevue Ferry! Ferry Captains Tom and Judy Bixler invite you aboard America’s oldest privately owned ferry. Why not take a short ride across the Tred Avon River and enjoy the beautiful scenery! The ferry can carry up to nine cars, numerous motorcycles, bicycles, and pedestrians on each trip. RV’s, trucks and trailers are also accommodated, based on size. Your “ferry tale” awaits! Call for details or visit their website. Service begins at 9:00 a.m., except closed December through March. Cash/Check only. ATM available in town at the Oxford Market and at the Bank. The Ferry is located at the end of Morris Street & The Strand.